Over the summer, Air Cadets and Sea Cadets from across the region have had the opportunity to attend annual camp with Durham and Northumbria ACFs. 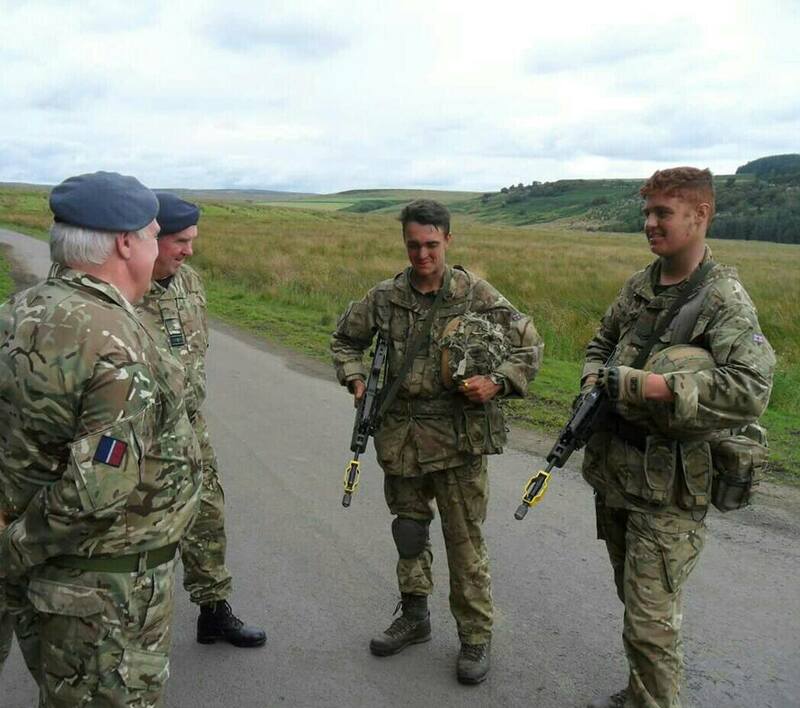 A group of Air Cadets from Durham/Northumberland Wing travelled to Otterburn training area to join Northumbria ACF on their annual camp. They were allocated a place in one of the four training groups based on their fieldcraft experience. Northumbria ACF Cadets are cap badged to a number of regiments, so the blue beret was just one among many different headdresses. The Air Cadets were made more than welcome by all personnel and were treated as an integral part of the team, led by County Commandant, Colonel David Middleton MBE TD. Every cadet spent at least two nights out in the field, using a shelter sheet and living on issued 24-hour ration packs, whilst using the new issue gel field cookers. Two Cadets from 1000 (Blyth) Squadron, Sgt Forsythe and Cpl Asbitt, were part of the three-star training group, taking part in various fieldcraft drills and exercises and eventually being appointed section commanders. As section commanders the two NCOs were responsible for a number of other cadets’ health and welfare, and commanded groups in the field. As well as fieldcraft, the cadets took part in navigation exercises, adventure training on the hills and on the water at Kielder, as well as shooting and first aid. Every cadet fired at least one type of weapon: the junior “one star” cadets using the Scorpion air rifle, with more senior cadets using the No 8 (.22) rifle and the L98A2. Cadets with specialist skills were used as cadet instructors, so it was not unusual to see ATC cadets teaching ACF cadets first aid, and ACF cadets teaching ATC cadets navigation. During the time at Otterburn, there were visits from a number of senior officers, of one and two-star status. This included Major-General Paul Nanson CBE, the Commandant of the Royal Military Academy Sandhurst. He spoke with the cadets to see how well the two cadet organisations had worked together. During the visit from Wing Commander Harris, Officer Commanding Durham/Northumberland Wing, both he and Colonel Middleton heard at first hand of the many highs and very few lows of the two-week camp. Wing Commander Harris said, “Camp places at RAF stations are increasingly hard to come by, so the offer of additional places from the ACF was gratefully received. Our Cadets enjoy the practical fieldcraft and shooting opportunities that they have with the Army Cadets, and it’s also beneficial for the Adults from the two organisations to work together”. Meanwhile, another group of Air Cadets travelled to Castle Martin in south Wales with Durham ACF. They enjoyed an exciting adventurous training package as well as the more traditional camp activities.